This event is always the most highly competitive race on the calendar, and the 2017 edition was no different. Duntov had seven cars under their awnings, five in Group 6 and two in Group 4. 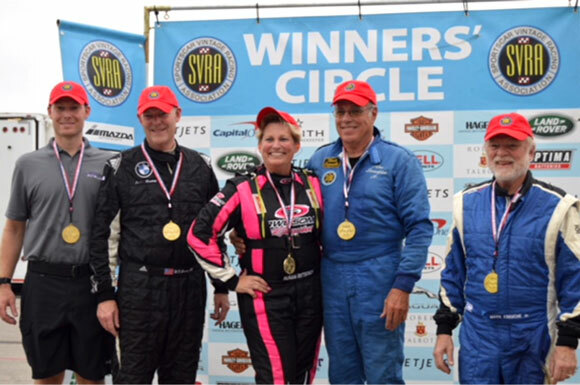 Susan Patterson again competed in Group 4, this time teaming up with SVRA’s driver training guru, Peter Krause. Peter helped Susie in her transition from the 4-cylinder Devin-MG in which she won the 2016 Group 4 points championship, to her 1964 Cobra, with its potent 260 cubic inch V8. 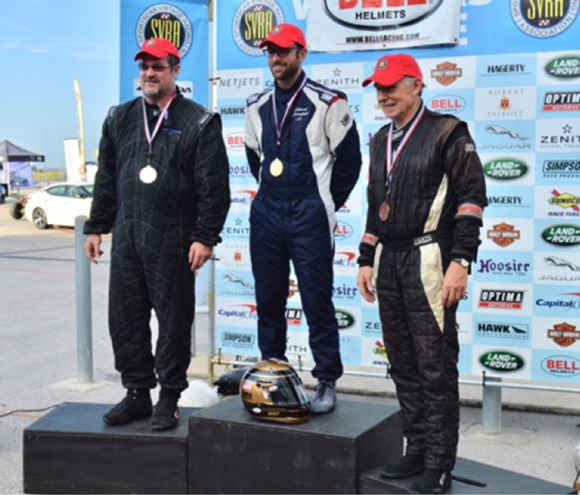 Susie ran the 60-minute Vintage Enduro with Alan Sevadjian for a Group 4 win. The car ran as high as 7th overall in a field with some very potent cars, including two GT40’s, and a slew of Group 6 Mustangs and Cobras. It may have been Susie’s greatest race ever! 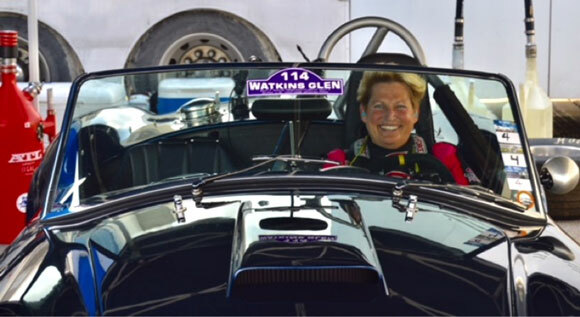 This was the race weekend Susie Patterson bonded with her Cobra! Susie won in her first Enduro ever! 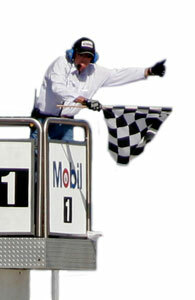 Colby Hillman invested a lot in his preparation for COTA. 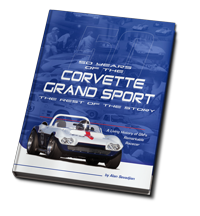 He entered two Group 6 cars, the number 11, small-block, historic, 1968 Mecca Corvette, and his familiar number 73, white, big-block 1969 Corvette. Colby Hillman's immaculately restored 1968 Mecca Corvette in its first outing. Unfortunately, the National Championships races happen during the peak of Colby’s business year, and he ended up missing the race, as he had to tend to business in Ohio Saturday and Sunday. While he was there, he quickly came up to speed in his big-block car, while Edward Sevadjian gave the Mecca car its first shake down run. The Mecca car was quick right out of the trailer, and Edward turned a lap of 2:28 in his first session, which turned out to be the second fastest time of the weekend for a small-block Corvette. Tony Parella ran only one session before the qualifying race on Saturday and with no practice, he came within a whisker of the pole. He passed for the lead about half way through the qualifying race and went on to win, in spite of the fact he was driving a car with stock steel wheels and a completely stock interior including driver’s seat! He chose not to run on Sunday, which was really unfortunate. 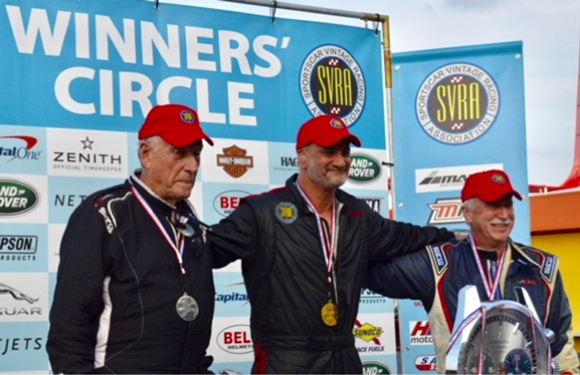 Tony bought SVRA to combine his passion for vintage racing with his passion for business, but it is really hard to do both without offending somebody. Dr. Clair Schwendeman in Sam Lecomte’s 1965 big-block Corvette. 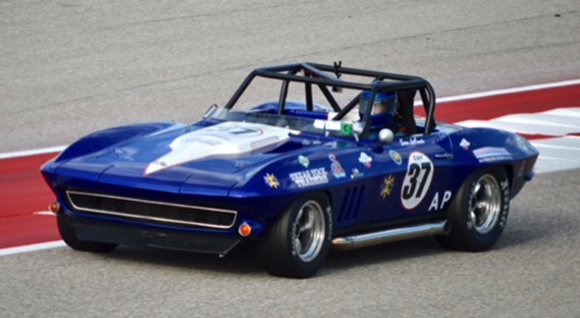 Clair Schwendeman’s familiar red white and blue number 37 Corvette was not scheduled to be ready in time for COTA, and his friend Sam Lecomte loaned him the ex-Chris Hines, ex-Tony Parella, big-block 1965 roadster for the race. The car hadn’t been run since Portland in 2016, so it got a lot of maintenance during the four-day event. It also got hit in the side by an out of control big block Cobra, but the Duntov team had all the spares necessary for the repair, and Clair never missed a session. Sunday morning, right after the 60-minute Vintage Enduro, Clair teamed with Alan Sevadjian in the 90-minute Historic Enduro. Clair and Alan each won helmets when they won this race in 2015. In 2016 the rules changed, and the only Group 6 cars in the Historic Enduro were big-blocks, all the rest of Group 6 had been moved to the Vintage Enduro. Clair and Alan were leading by a comfortable margin when late in the race, a missed pit-to-driver communication led to the car running out of gas! In 2017, an even more bizarre situation temporarily robbed the duo of another victory. After winning the race by over a lap, Clair's borrowed car was disqualified for being 120 lbs underweight. Later it was determined that SVRA’s records for the car showed it to have a T-101 racing transmission that it didn’t have – a transmission that carries with it a 150 lb weight penalty! The car was raced exactly as it had been raced for years by Chris Hines, and as such, it was 30 lbs over the weight minimum, not 120 lbs under. 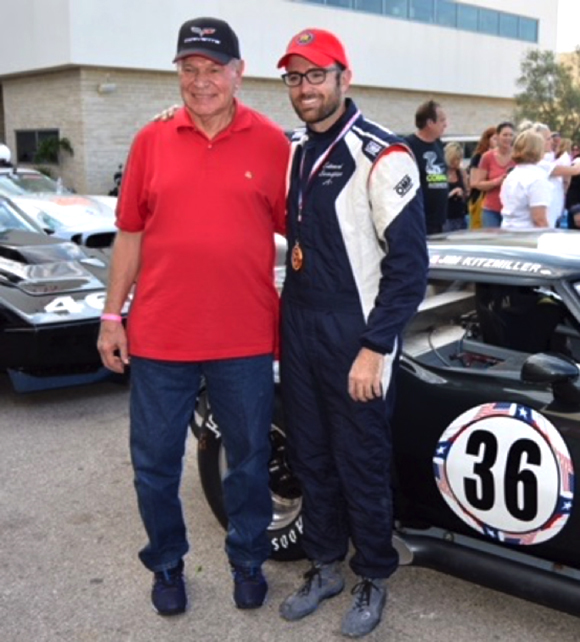 In the feature race for Group 6, for the third year in a row, Edward Sevadjian drove Jim Kitzmiller’s 1969 Corvette to victory. Edward qualified on the pole, won the Qualifying Race and then the feature. Clair brought Sam’s Corvette home seventh overall and third in Corvette AP. 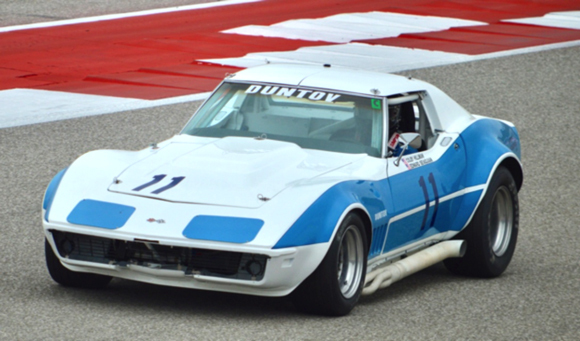 Right behind Clair was another Duntov big block Corvette, driven by Mark Hilderbrand. Three of the top five Corvettes, in the biggest race of the year, were prepared at the Duntov shop, and two other super quick Duntov Corvettes were sitting idle under the Duntov awning due to Colby Hillman’s early departure. This was Edward Sevadjian’s fifth SVRA Championship Helmet. 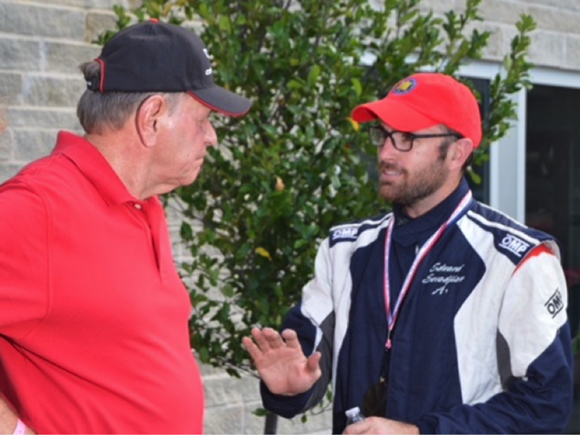 Car-owner Jim Kitzmiller gets a debrief from his winning driver. Jim and Edward did it again.